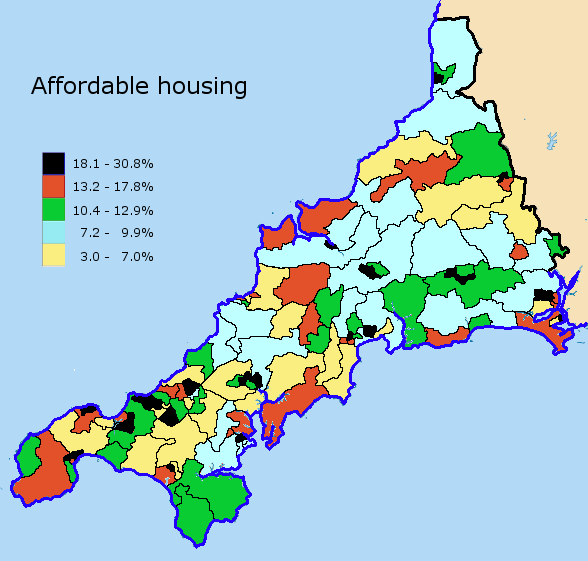 Cornwall’s housing stock | Cornwall – a developers' paradise? 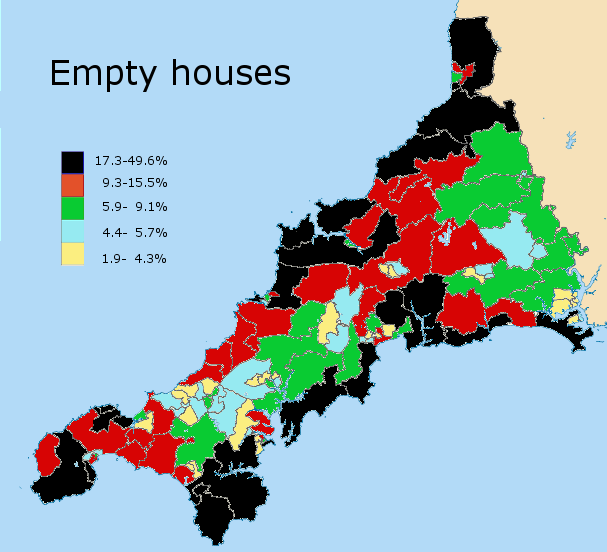 The 2011 Census allows us to derive a snapshot of the housing situation in Cornwall. Affordable housing means social rented and shared ownership houses. This is the smallest component of our housing stock, amounting to just 12.8% of the total. However, there’s a range from over 30% at Redruth North to a mere 3% at Saltash Burraton (pre=2013 wards). As the extremes imply, the highest and lowest proportions of social housing both tend to be found in urban areas. Indeed, contrasts within towns are as important as differences between areas. That said, those wards with the highest numbers of affordable housing are not unexpectedly found in the towns. However, some rural wards, notably the Roseland, the Rame peninsula, the Camel estuary and St Buryan all have higher than average proportions of affordable homes. These are also the places with the highest number of second homes and the highest house prices, which allows developers to build a higher proportion of such housing yet still make their profits out of over-priced houses for the better-off. 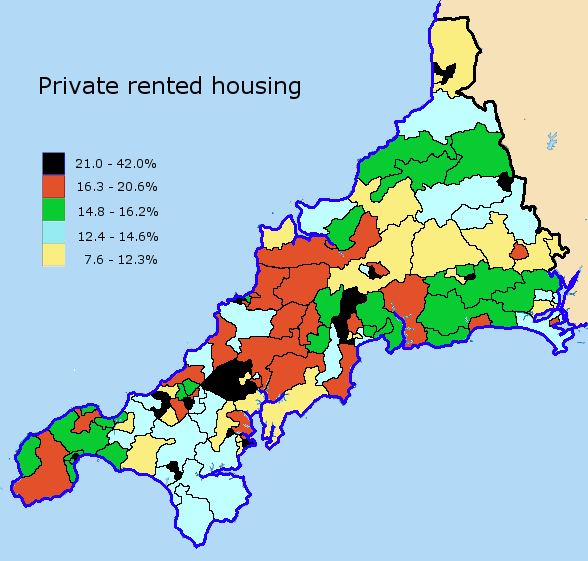 The private rented sector accounts for 16.8% of our housing stock, although the standard deviation is slightly lower than for affordable housing, meaning the spread is a little more even across Cornwall. However, there are large variations at the top end, with the town centres being places to find rented properties. Private rented houses are generally most available in urban wards although again those parts of towns with high numbers of owner-occupied estates will consequently have low proportions of rented properties. In rural Cornwall there’s a band of wards in mid-Cornwall between Truro and Wadebridge with average or above average proportions of private rented houses. Conversely, the Lizard and Carnmenellis, most of Truro and east Cornwall have relatively low proportions. Finally, private rented housing is also noticeably scarce in some areas with high numbers of second homes, for example the Lizard, Padstow and St Endellion and the Roseland. Is this a result of competition from holiday lets? 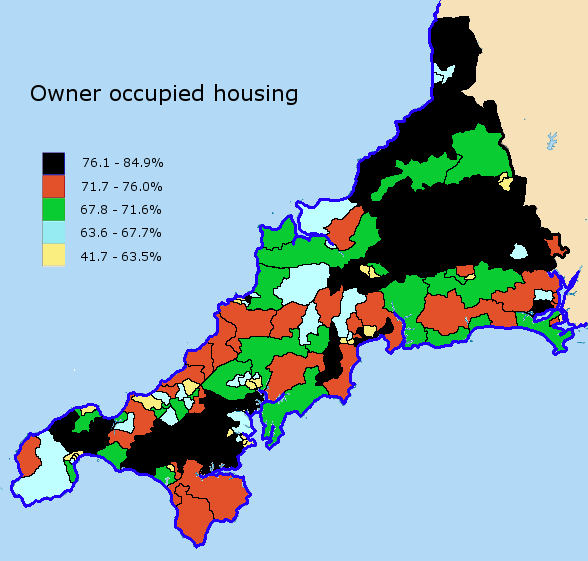 Owner-occupied housing makes up over two thirds of Cornish housing, 68.8% to be precise. A combination of a nineteenth century tradition of home ownership in Cornwall’s former industrial areas, a reluctance of penny-pinching local councils to build council housing in the ‘good old days’ of the twentieth century, and the rapid development of soulless ‘suburban’ style estates since the 1960s produces this state of affairs. Owner-occupied housing is dominant across most of Cornwall with the majority of wards having proportions of such housing within 5% of the mean. There is some variation at the bottom, with the older central areas of towns – especially at Liskeard, Penzance and Newquay – seeing the lowest proportions. Meanwhile the wards where the housing is most likely to be owner-occupied can be found in two rural areas – one in west Cornwall between Camborne-Redruth, Falmouth and Helston and the other including a large chunk of the north-east. And then there’s a lot of houses – almost 29.000 – with no usual resident. The vast bulk of these are second homes and holiday lets, permanently subtracted from the stock of housing accessible to locals while pushing up the price of houses, whether to buy or to rent. Tax the second homes not the bedrooms of the poor! The detailed data from which these maps were derived can be accessed here.